It was a weekend against the West as the no. 5 ranked McGill Redmen (7-1) took on the Guelph Gryphons (5-5) and the Western Mustangs (5-3) in a Hype Week double-header at McConnell Arena. 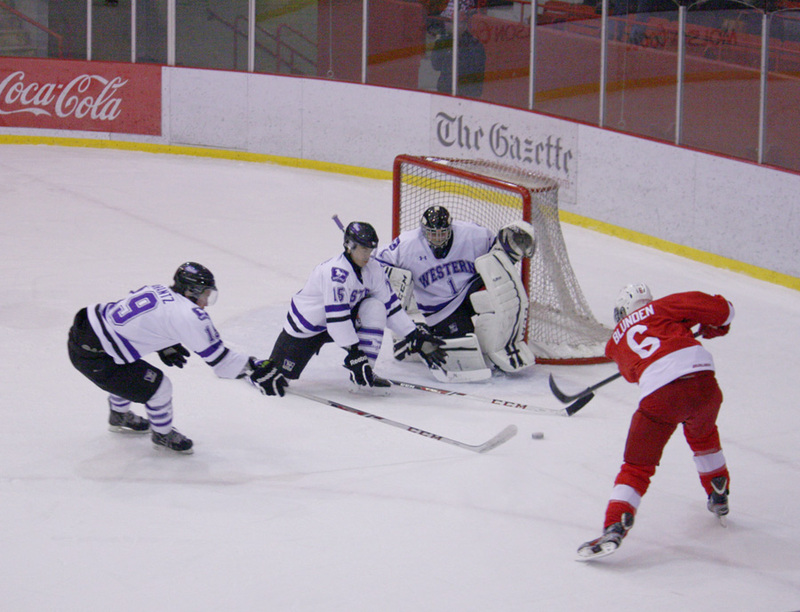 The Redmen matched-up against the Gryphons for the first time in four years, beating Gueph 3-2. Rookie goaltender Jacob Gervais-Chouinard was tremendous for McGill, turning away 19 shots against Guelph. The team has come together well after losing key players to graduation last year. Beyond the great play in net this season from Gervais-Chouinard and masters student Andrew Flemming, McGill’s ability in the penalty kill is nearly unrivaled across the OUA. The talent in shorthanded situations was on full display Friday night. The Redmen struggled out of the gate to begin the game, turning the puck over a number of times at the Guelph blue line before finally settling into a rhythm. However, despite its late period surge, McGill finished the stanza with a paltry seven shots on net—an uncharacteristic output for a team that has shown a love for forcing the puck up the ice. McGill ended up finishing the game with a lopsided 43-21 shots on net differential. According to Nobes, McGill has focused its offence on pushing the tempo of the game. It was a different team that started the second period, as sophomore Cedric McNicoll immediately netted a goal for McGill just 50 seconds out of the locker room. The team managed to maintain their rhythm for the remainder of the period, registering 18 shots on net. Sophomore left-winger Patrick Delisle-Houde added to the Redmen total at 17:25 to help the Redmen close out the period on top, 2-0. The Redmen quickly called a timeout to compose themselves after Guelph scored two quick goals in the span of one minute. The last 10 minutes of the game were filled with anxiety on the Redmen bench as the momentum was swinging in the direction of the Gryphons. Delisle-Houde saved the squad from an upset as he netted the game-winning goal on a power-play with 27.4 seconds left on the clock, sending the crowd into a frenzy. This year’s team looks very different from last year’s squad, with multiple rookies in the fold and other players ascending into more important roles. If the team remains focused, the Redmen have the chance to improve upon last season’s disappointing finish. The hosts followed up this win with a tight 5-4 victory against no. 7 ranked Western Mustangs. McGill now sits in first place with a one-point lead over the Queen’s Gaels in the OUA East. The Redmen will go on the road to play against Brock and York on Nov. 15 and Nov. 16, before returning home to McConnell Arena to face Laurier and Waterloo in back-to-back matches on Nov. 22 and Nov. 23.